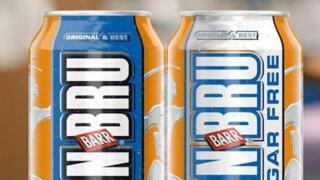 The maker of Irn Bru has reported its sharpest annual rise in sales of the soft drink, up by 8%. AG Barr issued its figures for the year to January with strong results also for its Rubicon fruit drink brand, up 5%, and Funkin mixers, up 25%. The firm cited an increase in market share, and moving most of its products out of the reach of the new sugar levy. Next week the UK government will begin to tax soft drinks with more than five grams of sugar per 100 millilitres. By reformulating its drinks with less sugar, AG Barr says 99% of products will not be affected by the levy, which is aimed at improving health. The Lanarkshire-based company has also announced a new strategic partnership with Bundaberg, the family-owned Australian firm best known for its ginger beer. AG Barr reported a more modest 4% growth to international sales. One reason for the rise in Irn Bru sales was a boost to its plastic bottling capacity at the new Milton Keynes plant. It has also sought to align its marketing with the growth in "food-to-go" in retail chains such as Greggs. Newly-launched Irn Bru Xtra sold the equivalent of 60 million cans during the year - a third of the figure for Irn Bru Sugar Free. Rubicon Spring water, another new product, sold 17 million bottles. Overall, revenue in the year to January 27 was up 8% to £278m, while pre-tax profits rose 4% to £45m. Roger White, chief executive of AG Barr said the firm has delivered "consistent broad-based sales growth across our portfolio, well ahead of the soft drinks market performance throughout the year, supported by successful innovation, strong core brands, and further development of our partnership". He added: "The UK economy is likely to expected to remain uncertain for business as a whole, with regulation, changing customer dynamics and consumer preferences adding further volatility for the soft drinks industry."